The Lucien Adjustable Floor Lamp transcribes the versatility of a task lamp into a context that is both delicate and dynamic. This pharmacy-style floor lamp is available in Antique Brass or Polished Nickel. 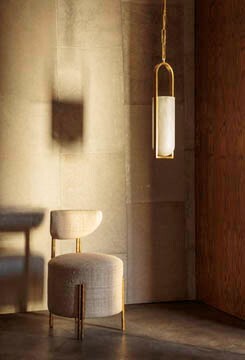 Attaining a seamless coexistence of form and function, the Larchmont Floor Lamp derives inspiration from Pre-Modernist architectural styles with particular attention paid to materiality and geometry. This adjustable pharmacy-style floor lamp is available in Antique Brass, Polished Nickel or a combination Brass/Bronze mix, each with Frosted Glass.